Why#RockYour Socks on March 21st? 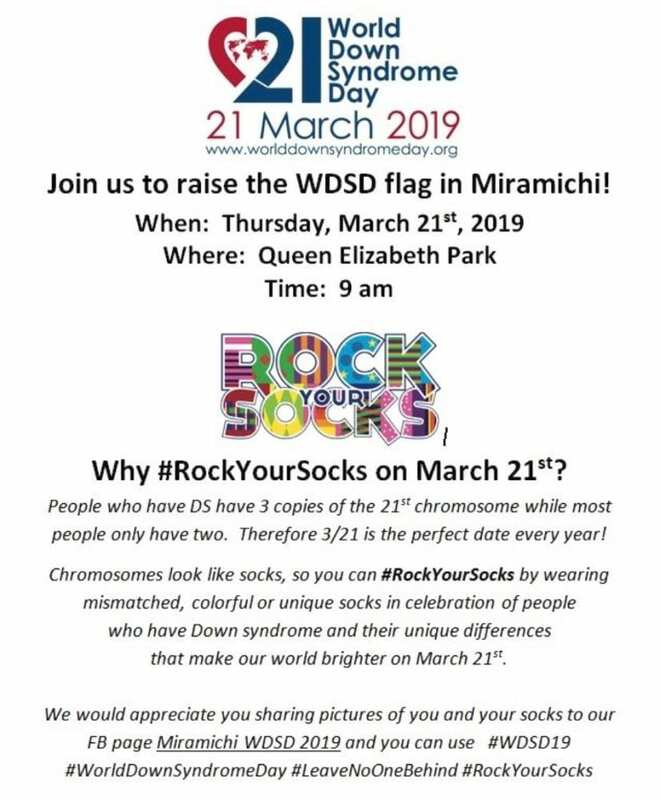 On Thursday, March 21st, 2019, beginning at 9:00 a.m., come out to the Queen Elizabeth Park located in the Former Town of Newcastle’s Town Square to help raise the flag for WDSD (World Down Syndrome Day) on the Miramichi. Rock Your Socks – Why#RockYour Socks on March 21st? People who have Down Syndrome (DS) have 3 copies of the 21st Chromosome while most people have two. Therefore, 3/21 is the perfect day every year! Chromosomes look like socks, so you can #RockYourSocks by wearing mismatched, colorful or unique socks in celebration of people who have Down Syndrome and their unique differences that make our world brighter on March 21st.